HIGHLIGHTS: The Gorsuch Fitness Trail was constructed in the summer of 1982 and was funded through donations made to the Bethesda Hospital Foundation. 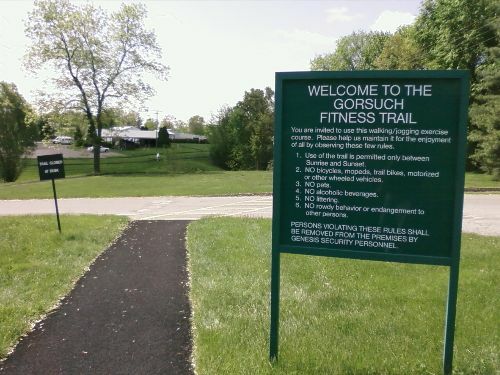 It was named after a major contributor, Charles A. Gorsuch, and was quickly adopted by the community of Zanesville as a place for area residents to exercise. Bethesda Hospital was purchased by and is now managed by Genesis (under the Genesis Health Care System), and the trail is a one mile route that starts at the back of the hospital grounds. It runs along and across a stream at the back of the property and is open to the public during daylight hours.